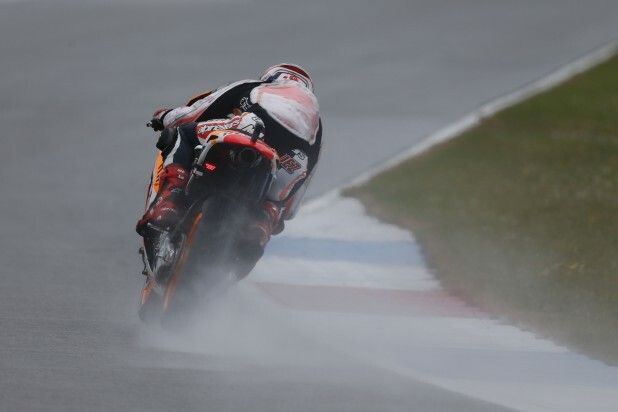 Marquez: "there are still things to improve"
Repsol Honda’s Marc Marquez has finished the opening day of the 65th Assen Grand Prix in third overall with mixed conditions, but was fastest in the afternoon just 0.252 ahead of Valentino Rossi in second. The Spaniard finished in third in the damp FP1 behind Jorge Lorenzo and Cal Crutchlow, and was able to secure a dry set-up for the weekend. When the rain came in the afternoon, Marquez was able to set the fastest time of the afternoon despite Lorenzo breaking his collarbone. Marquez’s time of 1.35.883 secured him the third fastest time overall and a 1.47.617 which was the fastest time this afternoon. Dani Pedrosa secured the fifth fastest time of the opening day at Assen, 0.151 seconds behind his team-mate, Marquez’s time in third. Having only ever won once in Holland back in 2002 on a 125cc machine, Pedrosa has seemed to struggle however with Lorenzo now out of the race with a broken collarbone, the Spaniard’s team-mate Marquez is his clear main rival for the race win, in an attempt to increase his championship lead of seven points. The use of dry and wet track time should help Pedrosa to be prepared for the race on Saturday, although he still has things to improve on. His time of 1.36.034 put him 0.771 behind Lorenzo in first position. Next Next post: Rossi: "Its been a postive day for us"